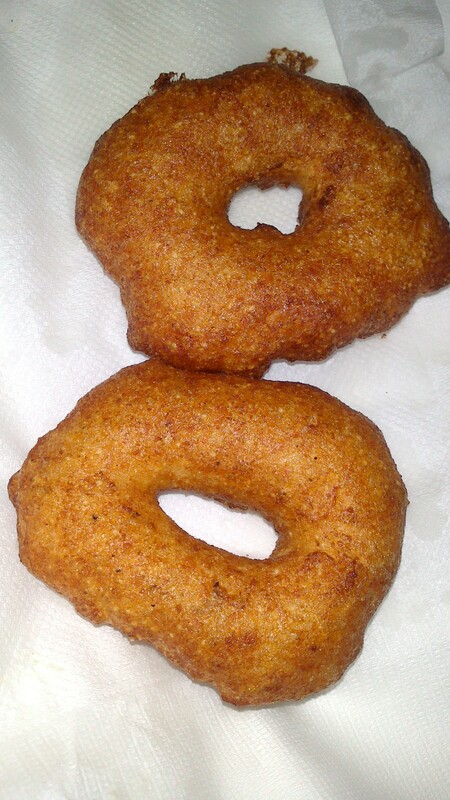 I always thought that for making Medu Vada you need some kind of mould, otherwise how is it possible to get that hole in center?! But recently, i had hubby’s Bhabhi and her sister visiting us and i made Masala Dosa, as Bhabhi is fond of it. Her sister told me that she regularly made Medu Vada at home, and told me how she did that. 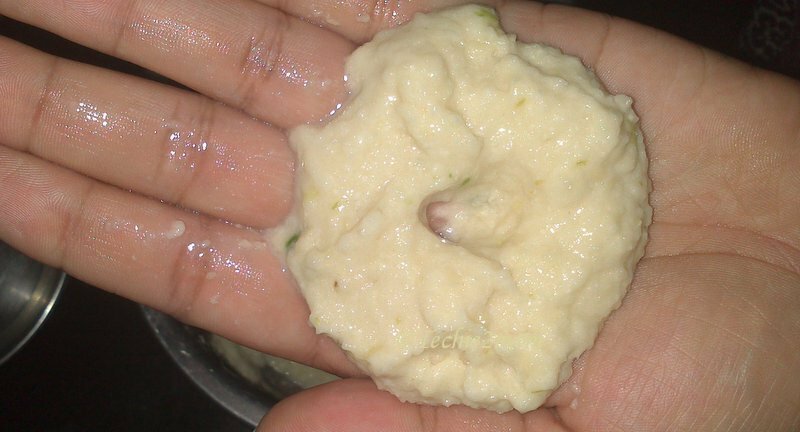 1) Take the soaked daal and grind it in mixer. (If you don’t have the Green Chilli and Ginger paste and don’t have the patience to cut it finely then, this is your chance to add the chilli and ginger in the mixer along with the daal). 2) Don’t add extra water. Remember the trick here is to keep the batter really thick. So use water sparingly if you have to. 4) Heat oil for frying in a kadai. 5) If you are making it for the 1st time then please practice making the hole 1st and then heat the oil. 6) To make the hole wala medu vada, take water in a bowl, wet your hands. 7) Take batter (of the size of a big lemon) in your hand, make a flat round using other wet hand. 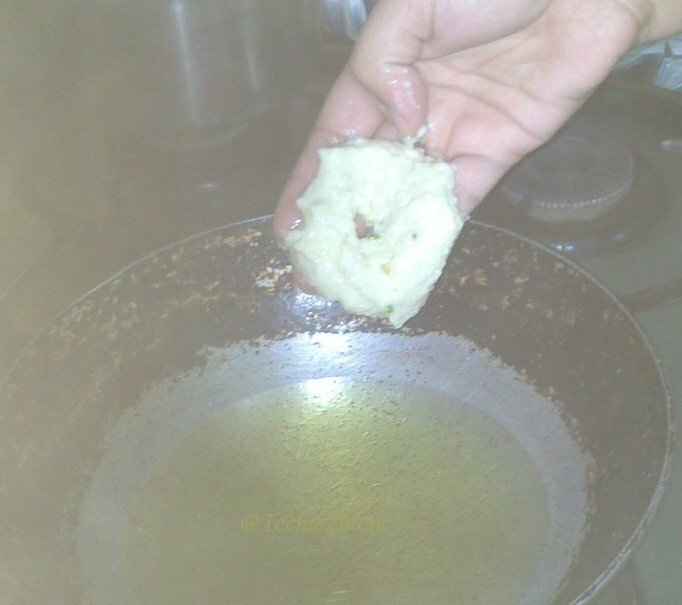 8) Now, using your thumb make a hole in the center, and carefully slide the vada with the hole in the hot oil. To take the vada off your hand and to put it in the oil, you can use another hand, or a spatula (Tavetho/ Chaletho/ Palta/ Bhatiyu – basically any flat spoon). Making hole in the Meduvada.. Dropping in the oil using my hand…. 9) Fry it in the hot enough oil and take out on tissue paper. That's ok!! It's just a cosmetic issue…the real thing is taste!! We are good, it's just that..It's Zini's vacation. And also i had guests at home so was hard pressed for time…Hugs..